Intertops Casino launches a Super Bowl themed casino bonus promotion this week as the biggest sports betting event of the year approaches. The popular online casino, one of the first and still one of the best, is taking players on a $70,000 Super Bowl Road Trip to Indianapolis for Super Bowl XLVI. In a final draw on March 6th, 18 players will win cash prizes up to $1000. Between now and then hundreds more players will also receive bonuses up to $250, based on their game play, for a total of $70,000 in giveaways. Intertops Casino players automatically earn points whenever they play any of its more than 300 casino games. The top players are ranked in six levels based on their deposits, wins and losses. For this month’s Super Bowl promotion the player categories are named after recent Super Bowl host stadiums. Players have until March 5th to accumulate points and can check the online Scoreboard any time to see their current points and where they rank. Players begin their $70K Super Bowl Road Trip at Dolphin Stadium in Miami Gardens and, as they accumulate points through game play, they proceed to the next level, University of Phoenix Stadium in Arizona. The following stop is Raymond James Stadium, Tampa. The journey continues to Sun Life Stadium in Miami and then Cowboys Stadium in Texas before reaching the ultimate destination, Lucas Oil Stadium in Indianapolis -- home of NFL Super Bowl XLVI. Generous bonuses aren’t the only reason so many players are so loyal to Intertops Casino. They also enjoy the outstanding selection of online casino games and appreciate the attentive customer service and easy deposits and withdrawals for which the casino is well known. 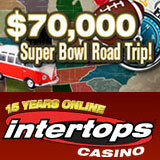 Launched in 1998, Intertops Casino is one of the first and still one of the most trusted online casinos in the world.